I’ve always believed that you get further ahead by helping each other. Since I started this blogging journey, I’ve met and come across so many inspirational women on Instagram. While social media gets a bad rap, there is a good side to it as well…it connects people from all over the world in a way that was never before possible. A while ago I had the opportunity to meet up with some blogger babes. I’ll have to admit, it was a little intimidating at first. We only knew of each other through stalking one another on Instagram, but based on our “research,” we developed a mutual respect and admiration for each other. The meet up began at Alfred Tea Room in West Hollywood. If you haven’t been there yet, it is not only a must-shoot place for Instagram, they have a wonderful tea selection and boba that you have to try. It is absolutely tiny in there, so take your photos on the steps to the side of the entrance, or in front of the pink wall by the door, or in the alleyway of the back entrance. From Alfred Tea Room we walked to the cutest street ever which houses gorgeous stores like Isabel Marant, Marc Jacobs, Zimmerman, Joie, The Row, etc. And of course, what would be the point of a blogger meet up without some yummy food? If you don’t know anything about bloggers, we love our food and we love to take pictures of it too. We went to Ysabel, which not only has delicious bites but a gorgeous outdoor space as well, to have some brunch and really get to know each other. All in all it was amazing to hear everyone’s stories on why they became a blogger, what they were working on, and where they were headed. The best part of hanging out with bloggers is the mutual understanding of those annoying #bloggerlife habits. I mean, who else would resist snatching a fry and waiting for all the food to come out so we could get a photo? Who would remind you before a photo is taken that your bag is backwards or your necklace is flipped? And really, who would take out all their accessories on hand to decide which one would be the best for a flatlay? 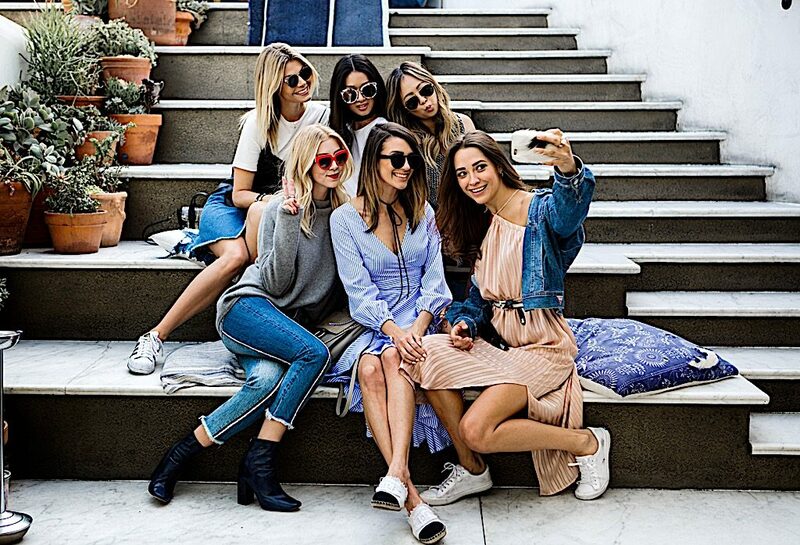 Seriously, blogger babes are the best! Needless to say the initial awkward hellos and hugs turned into genuine friendships and sounding boards for building our brands and helping one another out. We ended the afternoon with friendship rings by Katie Dean Jewelry and the satisfaction of knowing if we ever needed each other for anything, we would be there. This blogger meet up was so successful that for the first time ever, I posted someone other than myself on my Instagram feed (seriously so major)! If you’re a blogger and haven’t done something like this already, I would highly recommend it. The friendship and the advice you give and receive is so inspiring and really helps to motivate you. And just in case you aren’t following these amazing babes on Instagram yet, please take a look at these accounts and I promise you will not be disappointed! Thank you to Lauren Alexandra for capturing this amazing day! I love these photos. It looks like you had a great time and the girls are really lovely. Lucky you. I wish I could meet nice bloggers in Switzerland as well. Have a wonderful Monday, Christine! Aw, I love this post. I have met a few amazing girls through blogging and believe helping each other is the best way. I keep telling others this, so I am so sorry if this come off as a broken record if you’ve heard me say it before, but I really love seeing people succeed around me. There are so many companies and brands who love to work for influencers, so I think there’s enough room for everyone. I mean, look at how many brands are out there. And, if a brand is looking to collaborate, I’d rather see someone I know get selected than someone I don’t. How inspiring is it to be around people you really care about succeed, right? 🙂 Thanks for sharing your positive message and for always being such an inspiration. I completely and utterly agree Miki! There is so much room for everyone and we actually benefit more from helping each other out. We have to stick together! All of us are different in our own way and if we all had the same exact tee to style, we would all style it differently which shows that everyone has a voice and we can all be in this blogging world together. I would love to meet you one day as well Miki! Thanks Sharon! I too am so happy we met and we can text each other time to time and ask for advice. I wish I could see you more often, but I definitely plan on seeing you at more events this year. Blogging with friends makes it that much more fun! These photos are just amazing!! I love everyone’s looks!! We should shoot something like this here, there are quite a few bloggers in my town! I love catching up with them and swapping stories, as you say, no one gets it quite like other bloggers do. I’m off to stalk the girls here that I don’t know, I recognise a few! Awww, thanks Jenelle! You totally should do a meet up there! I wish I could join because frankly, I love all of your Australian bloggers. You all have such amazing styles and your designers are literally beyond!!! It would also be a great opportunity to reach out and get to know someone you’ve been stalking but haven’t met yet! I love meeting bloggers through Instagram in person. Over the last year or so I have made an effort to have one on one coffee dates and it’s been so amazing to connect with others that have the same passion. I hope one day we can connect too! Isn’t it so cool to connect via IG then meet in person?! It’s like an instant connection. I am going to try and make NYFW this fall and hope to meet you in person then! Cutest girls ever. How I love this kind of meetings and whish to meet similar really good and pretty cool bloggers like you. I’m really happy see all you happy together, and congrats for your outfits. Sending all my love from Italy. Hi Eva! Yes, the best way to meet bloggers is just to reach out to them. Many of them want to meet you too so it’s a good idea just to meet up over coffee and see how it goes from there! That quote at the beginning though!! So true. I really don’t get how we can get mean and envious of each other! I am sol glad to see that you had an amazing time with these blogger babes. I’ve been to a bloggers brunch lately and it was seriously so fun and heart warming. Talking with women who know the hustle of the blogging life is such a breath of fresh air! I am so glad you had a meet up as well. Isn’t it nice to chat amongst people that totally understand the business? It’s definitely great to have friends to keep you grounded and out of the social media realm too, but once in a while it’s fun to meet up with other bloggers and toss ideas around and just get to know each other better outside the squares we see on IG. Sounds like my absolute perfect day in LA 🙂 You hit all of my favorite spots in West Hollywood and with new blogger friends…… sounds even better ! I am hopefully moving to LA permanently this fall and hope to find a group like this !!! Looks like you all hit it off instantly and had a great day !!! 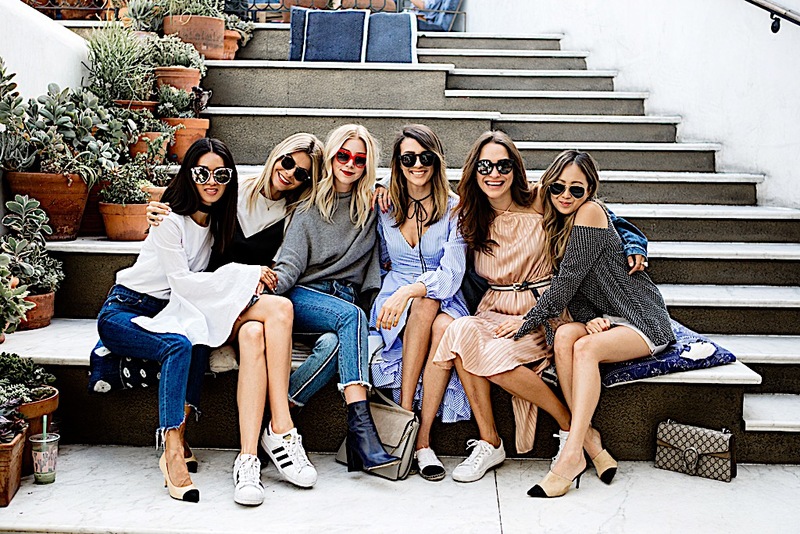 Having a girl squad is the best thing when you’re a blogger! It’s become such a cut throat industry that it’s nice to see girls getting together and supporting each other like we should! You all are gorgeous and it sounds like you’ve created a great friendship together! Such an amazing, inspiration post babe! This blogger meet up definitely sounds like such a great experience and thanks so much for sharing it with us girl! Hope you have a lovely week! love women that support one another! what a gorgeous, stylish group! How lovely is this! I wish there were blogger meet ups in the Bay Area. Looks like you had so much fun! couldn’t agree more babe, so nice that you found your squad!! all of you ladies are so stylish & gorgeous, looks like it was such a fun time! thanks for sharing your experience love. Aw I wish I could’ve joined you guys! It’s always so nice meeting other bloggers from the same area and Alfred Tea Room is actually really close by. It looks like you gals had a blast and it definitely helps to have a good support system since the blogging world can be quite vicious. Thank you Jess! It was fun and I loved meeting all the girls on a more personal level than just what you see on Instagram. Girl power indeed.My goodness! !You all look so so so good.I love the outfits but I love the pictures even more.What a gorgeous location. I love this!! Such beautiful ladies and it looked so fun babe!!! Aw absolutely love this post babe!! You all girl looks so great and stylish. In my blogging career I have also meet so many great women’s and have really enjoyed following them and seeing their pics. This is how I cross to your account too and been loving it since then. Girl power and support is the best. Please keep inspiring us babe! I really love this post!! You girls have amazing style!! Thanks for sharing your experience, I am so happy I came across your IG page, you are very inspiring!! How lovely!! I love seeing women empowering each other! aaaaaaaaand I looove your outfit in this! This post really inspires me, in the sense that once I move out of state, I will find a group of bloggers like this to hang out with. The ones local are so not friendly and it’s annoying. It’s like I’m too small of an account to be included in their group. Glad you all enjoyed yourselves! I am sorry to hear that Candace. I definitely think you will find the right group of bloggers to mesh with. Many are very sweet and open to helping one another out. Don’t rule a blogger squad out yet! If you are ever in LA, I would love to meet you in person! I’m all for the girl power and I am loving this post. You ladies look amazing!. I love blogger events! One may think meeting other bloggers can be intimidating at first, but it’s a chance to meet people who are passionate about similar things. So usually the bonding is natural and quick. You ladies are such a chic and fashionable bunch! Love each and every one of your outfits. Hope it was a fabulous time! I already know some of those beautiful ladies! I’m glad you had the chance to meet other wonderful bloggers and connect outside of social media. It’s really great to have a group of women who support each other no matter what. It’s probably also really nice having ladies who are in the same field as you just in case you needed to ask questions or get feedback on your blogging journey!! Babes on babes! This squad is major goals, and I’m so sad to have missed this outing. You girls all inspire me SO much!! I know Amy! I would’ve loved to finally meet you in person! There is always another time and we definitely have to meet up! Such a beautiful post! The words couldn’t be truer – surround yourself with the perfect girl gang and support everyone else on the ride, it’s the perfect way to do it! You are all such beautiful talented girls too. GOALS! Thank you Ashleigh! I am sure you have such amazing girls out there too…I am always inspired by girls all over the world. I love that blogging brought us together Adelina! You are such an inspiration and I love our chats together. I wish you lived closer but I have a feeling that this year we will try and meet up more often! Yes, while you are here visiting you should go. Also Carrera is another hot spot…I haven’t been yet but planning to go sometime soon. I am sure they don’t beat the ones in Japan, but they are definitely Instagrammable! You would be the center of attention Thomas! I would love to meet you in person one day! Perhaps at NYFW in September?! Where do you live Kay? That’s awesome that you are able to connect with the bloggers that live in your city though and meet up and have events together. Awwww, I am sorry to hear that Kay, but the benefit of social media is that we can connect across the world. I am glad you are able to find other bloggers and people to share your love of style and life with! Awww love this post for so many reasons and that caption is right on! I couldn’t agree more, sometimes the best friendships are found through internet these days. This blogging community is so amazing and the genuine people I have met through this journey is what makes it even more special. You ladies all look so gorgeous and seemed to have had the best time. Yes Kusum you are absolutely correct! The blogging community has been so supportive and amazing and I just love the idea of everyone understanding what each other is going through and being there to help out! Total girl squad goals! You all look so gorgeous in these photos. Sounded like such a fun day! I seriously need to take a trip to L.A. one day and take photos by Alfred Tea Room. I see it all the time on Insta and it always looks so darn cute there! Yes you should! I am going to do a post on some cute LA places to visit soon so definitely hit up some of those spots if you ever come by! Now you have found yourself one fab and fashion slaying girl squad! And don’t think that the fabulous Chanel shoes 3 of you ladies were wearing have escaped by vision too!! Hehe, yes, you definitely have an eye for Chanel! Oh it sounds like you guys had the best time! You all look so fabulous! I love hanging out with other bloggers, it can be so inspiring and of course it’s great to be around people who get the whole blogging thing!! It was such a fun time and I agree with you – hanging out with other bloggers is very inspiring! Hahah I love the opening quote. And I also am a tea drinker so totally relate there. The pictures look amazing and so cosy with all the blogger friends. Looks like you had a great time, Charissa. Thanks Charissa! It was a lot of fun and can’t wait to do it again! It’s all about girl power!! Beautiful pictures! Hi Eleni! Thanks babe and yes to fierce and fabulous girls! Thanks Bernice! I think as bloggers we all need to meet up once in a while to inspire each other! Awww this sounds like such an awesome experience! Can’t agree more with how social media connects people from all over the world. I myself have met quite a few inspirational individuals over Instagram and would definitely love to meet up with everyone someday although I’d definitely feel a bit intimidated like you did. Props to all you ladies for supporting one another! It truly was Jasmine and I am glad you have done it as well. I hope to do more of these because it helps to get ideas and just be together and support on another. You ladies are so lovely and I adore that you gals got together and that you’re so supportive of each other. Such a great post with an encouraging message!!! Thanks Danielle! I love meeting bloggers and hopefully will get to eat with you sometime because you always find the most amazing, drool worthy spots! I’ve always wanted to go to Alfred’s Tea Room. Seems like such a cute Instagram spot. And you guys are serious squad goals here. You all look so amazing in your fab sunglasses. Yes you have to go! It is definitely worth it because you can hang out in the area too and there are so many Instagrammable places to shoot at as well! I am so jealous that you babes all got to meet each other because I swear we don’t have those groups here in Aus. Everyone is in their own cliques and not supportive which I just hate – can’t wait to be back in LA and potentially meet you babes! No way! That’s surprising because there are so many amazing bloggers there in Australia. Although I do realize that it is a huge country so maybe you aren’t all central to each other. I would love to meet you in person one day too! So jelly! I’ve been only blogging a couple years and I’m just starting to meet some of the faces I stalk online. I really need to create a NY crew – your #girlgang is serious goals. Looks like an amazing day! You totally should Michelle! It is so fun to get together once in a while and just be around like minded people who share and understand the same passion! Okay so we need to hang out in real life. I’m totally of the same school of thought – helping others is the best way to succeed! Especially in a field like blogging which is so new – a win for one is a win for all. Love this post and the pictures. You girls are fabulous!